The Liberty girls basketball team came to play. The Falcons — visiting West Linn in non-league action on Friday — fell behind by 15 points in the first quarter, but rallied back into the lead early in the second. The Lions, however, were in no mood for an upset. They outscored Liberty by 21 points the rest of the way and rolled on to win 79-60 at West Linn High School. "I think our defense picked up a lot in the third quarter," explained West Linn sophomore guard Audrey Roden, who finished with 11 points on 4 of 11 shooting (including three 3-pointers) and added five assists, three steals and two blocked shots. "We switched it up a little going from man to zone and I think that shook them up a little and they didn't know how to respond." 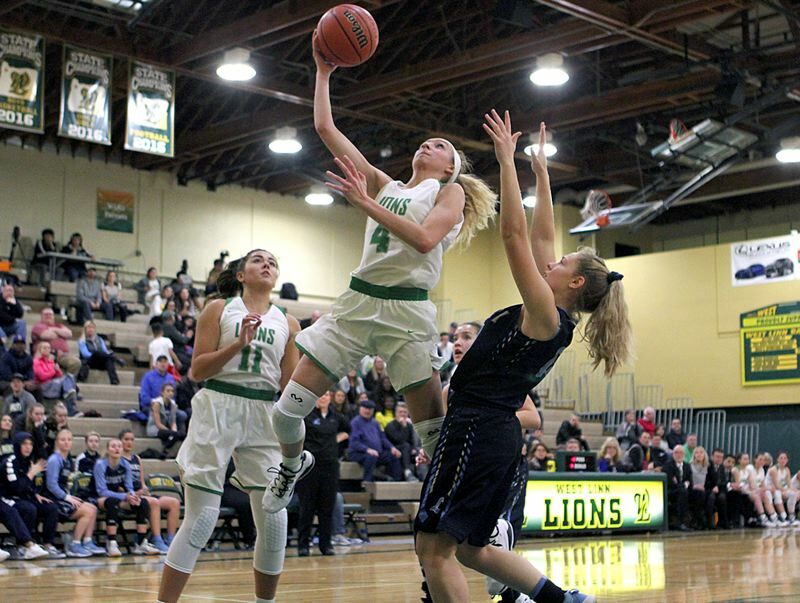 "It was mostly just getting out on their shooters because they were shooting really well in this game," said West Linn junior guard Cami Fulcher, who finished with seven points, eight assists, three steals and one block. "We were focusing in on the shooters and not leaving (Liberty sophomore guard Taylin Smith). We just had to talk on defense a lot more." With the win, West Linn improved to 2-0 in non-league play, while Liberty lost for the first time and fell to 2-1. "We've already played West Salem and Central Catholic, both really good teams, so I know what we're capable of and we (could have won) that game tonight," said Smith, who led Liberty with 17 points on 4 of 17 shooting (including one 3-pointer) from the field and an 8 of 9 day at the foul line, along with three steals. "I feel like maybe we just didn't give it 100 percent tonight." "I think our team had a little lapse in the second half and we just weren't together," said Liberty junior post Clara Robbins, who added 15 points on 6 of 16 shooting from the field (with one "3") and 2 of 2 foul shots, along with three steals and three assists. "Earlier, when we were getting all the steals, it really helped us. And if we would have played like that the whole game, it would have changed a lot, but we just kind of let up." The Falcons led 4-3 early in Friday's game, but the Lions caught fire there, outscoring Liberty 18-2 over the next 4 minutes, 48 seconds to grab a commanding 21-6 lead. Along the way, sophomore guard Payton Shelstad knocked down 3 of 4 shots (including one 3-pointer), while sophomore post Aaronette Vonleh — who led all scorers with 29 points — scored twice. The Falcons, however, did not go away. Instead, they turned up their defensive pressure, chased the Lions all over the court, forced seven West Linn turnovers and stitched together a 17-0 run that gave them a 23-21 lead with 6:15 to go in the second quarter. Smith led the way there, scoring once from the field and hitting five straight foul shots, while junior teammate Alyssa Chronister knocked down a pair of 3-pointers and Robbins added another four points. As big as the Falcons' turnaround had been, the Lions came back with one of their own — a 43-16 stretch that spanned more than 13 minutes — and used that to take control of the game for good. During that run, the Lions cranked up their own defense, forced nine turnovers, got out on the fast break and took advantage of Vonleh big-time. Vonleh — scoring on lobs and at the end of the fast break — knocked down 8 of 11 shots from the floor and hit both her free throws to score 18 points over a span of 12:14 and help her team extend its lead to 64-39 near the end of the third quarter. "Our game plan going into this was get (the ball to Vonleh) because there's no one on their roster who could stop her or guard her," Roden said. "That was our main goal. We struggled with it in the first half, but we really picked it up in the second." "We need to work on (defense) and getting the ball in to Aaronette," Fulcher said. "She's the key to this team because she's such an offensive threat." Robbins went for eight points in the fourth quarter and junior teammate Breeze Bartle added another six, but it wasn't enough. Vonleh added her final six points in the fourth quarter while Elisabeth Dombrow added four of her nine to keep the Falcons at bay. "We gave up some points, but we were there most of the game," Smith said. "I just feel like we may have gotten tired." "Our game plan was to have our guards crash, our bigs get (Vonleh) out and hope that did enough," Robbins added. "We did a pretty good job, but there were a couple of times when we let up on that little bit." For the game, Vonleh went 13 of 17 shooting from the floor and also hit all three of her free throws, Shelstad finished with 13 and Dombrow nine. For Liberty, Bartle, senior Emily Le and Chronister added eight points each. In upcoming games, Liberty plays Westview at 7:15 p.m. Friday, while West Linn plays at Camas at 7 p.m. Tuesday, then hosts Glencoe at 6:45 p.m. Friday.